To read this newsletter in an easy-to-read pdf form , click November/December: 2012. Throughout time, bread, the “staff of life,” has been a powerful symbol stretching far beyond the meaning that we associate with bread today. In passages too numerous to count, the Bible mentions bread, manna not only as the source/sustenance of life but also the Word, the will of God. Bread also symbolized covenant, a solemn vow, a supreme commitment. The sacred role of bread can be seen from one of the earliest Old Testament stories when Melchizedek, the King of Goodness, offered bread and wine to Abraham (Genesis 13). And as a symbol of covenant, Psalm 41, “Yea, mine own familiar friend, in whom I trusted, which did eat my bread, hath lifted up his heel against me.” In the New Testament, bread fed people in spiritual ways. Christ, the “Bread of Life,” serves loaves and fishes to the multitude and a communion meal of bread and wine at the Last Supper. For centuries, people of many faiths living in civilized yet far less comfortable times than our own today, gathered around a common table to break bread in a shared experience of gratitude and commitment. From these roots spin the contemporary references, “bread winner” as well as someone “short on dough,” a person in need of money. In contrast to the revered position of bread in the civilized world throughout time, bread has recently fallen from favor. Not only and justifiably is bread avoided by people with wheat intolerances, but also by many because it is “fattening.” Fattening is a noteworthy idea if the reference is to factory bread—a fractured, unsatisfying product that can lead to cravings for more food, as the body looks for the missing ingredients normally found in whole grains. Another reason to avoid industrial bread is because it is made with denatured flour that has been inflated by baker’s yeast to look like bread, then doctored with chemical additives to improve taste, texture and prolong shelf life. Other factors explain why bread has fallen from its traditional sacred place at the family table: We live in a world of calorie security that fosters few thoughts of gratitude, and our screen-based lifestyle scatters family members so that it is rare when we gather around a common table. Today, fractured foods that do not go rancid have displaced whole foods prepared with care in the home kitchen. For some ten thousand years, civilizations employed sourdough not only as a leavening to make bread rise but also to unlock the nutritional goodness of whole grains that with care and patience they ground into flour. From the earliest days, civilizations seemed to have an intuitive sense about sourdough’s power to ferment wheat to enhance its digestibility and nutrition. In recent decades with the introduction of baker’s yeast, the art of sourdough bread baking has been lost due to the convenience of mass-produced industrial bread. This shift began to take root in the 1870s when scientists successfully isolated Saccharomyces cerevisiae, yeast that they developed to survive temperature change and to expediently produce carbon dioxide gas to make dough rise rapidly and uniformly. Saccharomyces cerevisiae, known today as baker’s yeast, is a genetically modified form of brewer’s yeast. While it makes dough rise, it is a monoculture that cannot live cooperatively over time with the healthy bacteria found in sourdough cultures. This is important, as discussed below, because sourdough bacteria give bread its complex taste, pleasing texture, and health benefits, while also acting as a natural preservative. When commercial bakers switched from sourdough to baker’s yeast to adapt bread baking to assembly line mass production, bread became a tasteless fast food. To compensate for the absence of sourdough and time, the food industry improvised by adding back to dough synthetic vitamins, minerals, artificial dough conditioners, flavorings, and preservatives—all in an effort to try to make their chemically bleached flour and water mixture taste like bread. Sourdough is a gift of nature requiring only the mixing of flour and water. Mixing flour and water not only captures wild yeast and bacteria from the local environment, but it also activates the culture to begin aerobic fermentation whereby yeast begin to produce carbon dioxide and bacteria work to develop complex flavors. Over time with successive feedings of flour and water and mixing, sourdough cultures evolve to produce a stable culture where yeast and bacteria live symbiotically. The high level of acidity from lactic and acetic acid protect the culture from harmful bacteria, and microflora that do not support the culture gradually die away. Grow Local. Growing sourdough starter is the epitome of “Grow Local” and “Slow Food” right in your own kitchen. My Martha’s Vineyard culture, for example, would contain local strains quite different from those of a starter kept by a home baker in Chicago or Seattle. Buying a San Francisco culture so that I could replicate the wonderful sourdoughs of the Bay Area would be short-lived, since it would soon be overtaken by microscopic wild life of the Vineyard. Because cultures differ by region, their behavior and taste vary: some rise more rapidly than others, and each has its own coloration of sour, yeasty aroma, and flavoring complexities. Sourdough Culture is an Ecosystem. Cultures are fascinating examples of microflora too small for the eye to see that work in cooperation to preserve a stable balance between yeast and bacteria. Sourdough culture generally contains one local strain of yeast and between two to four types of bacteria. Contained in a single teaspoon are some 50 million yeast and 5 billion bacteria. In their symbiotic relationship, neither strain competes for the other’s food: Wild yeast, microscopic one-celled fungi, eat the simple sugars fructose and glucose in flour, but since they are not able to break apart maltose into its two glucose molecules, they leave this work and the resulting glucose molecules for lactobacilli to consume as food. As an additional service to the culture, lactobacilli, the major bacteria in most sourdough cultures, produce lactic acid which lowers the pH of the culture to between 4-4.5, a level of acidity that protects the culture from harmful invaders. Like lactobacilli, baker’s yeast also thrives on maltose, which is why in the ideal baker’s yeast should not be added to a sourdough starter because it would compete with lactobacilli for the same food. How the ecosystem works. Yeast and bacteria work symbiotically to transform through fermentation any bland mix of flour and water into mouth-watering loaves of bread with texture, aroma and complex flavorings. Yeast contribute bubbles in the form of carbon dioxide gas, as well as flavoring from alcohol and glutamate (which imparts the savory umami taste). Yeast act on flour and water in two stages, respiration and fermentation. During respiration (also known as aerobic fermentation) when yeast have access to oxygen, they produce carbon dioxide gas to help make dough rise. Later, in the absence of oxygen (for example, when starter is capped or dough is covered to limit oxygen) anaerobic fermentation begins, which is when yeast produce alcohol and other important flavorings. Like yeast, sourdough bacteria are single-celled microflora that feed on the sugars, proteins, and fats of whole grain flour to improve dough’s texture, nutrition, and acidity to retard spoilage. They also produce their own unique combination of flavors, including the classic sour taste derived from their byproducts, lactic and to a lesser degree acetic acid (vinegar). To allow sourdough to fully develop these complex flavorings from its acids, alcohols, and other compounds requires about 12 hours, so planning, time and patience are the key factors tied to successfully using sourdough—not hard work. Sourdough bread: flour, water, sourdough starter. Salt is added later after fermentation is underway. Wonder Bread: wheat flour, water, high fructose corn syrup or sugar, yeast, soybean oil, barley malt, wheat gluten, salt, calcium carbonate, sodium stearoyl lactylate, vitamin D3, vinegar, mon- and diglycerides, calcium sulfate, monocalcium phosphate, yeast nutrients (ammonium chloride, ammonium sulfate), enzymes, yeast extract, wheat starch, calcium dioxide, ferrous sulfate (iron), B vitamins [niacin, thiamine, mononitrate (B1), riboflavin (B2), folic acid], soy lecithin, azodicarbonamide, soy flour, whey, calcium propionate, datem, sorbic acid. 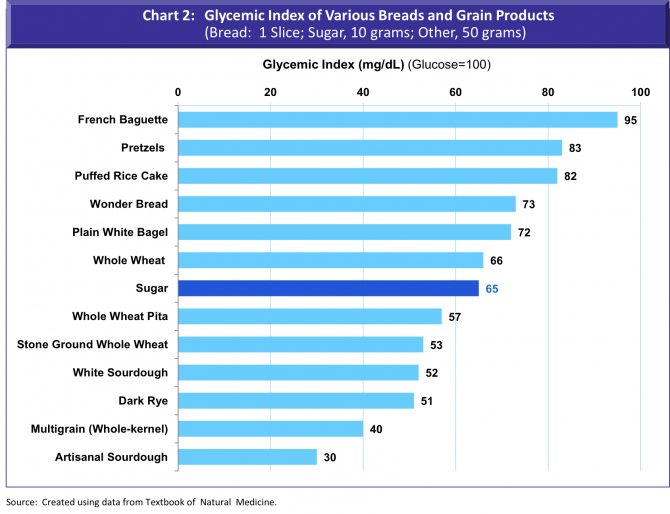 The glycemic index of bread. Beyond the benefits of improved texture, taste, and long shelf life, adding sourdough to whole grain flour and allowing these to soak before baking reduces the glycemic impact of bread. Lactobacilli in sourdough eat the carbohydrates in flour, producing lactic and acetic acid. These acids retard the rate of starch digestion to reduce the blood sugar impact and the body’s insulin response to carbohydrates (see Chart 1 below). It may come as a surprise, but the addition of sourdough to white bread curbs the body’s blood sugar reaction (see Chart 2) so that a slice of sourdough white bread has a substantially lower glycemic index (52) than a slice of commercial whole wheat bread (66). In fact, the glycemic effect of a slice of commercial whole wheat bread is on par with sugar (65). It is also interesting to note that the glycemic index of commercial whole wheat bread is not much lower than Wonder Bread (73). This is because industrially refined whole wheat flour is not 100% whole wheat. Instead, whole wheat is finely ground and stripped of much of its essence, to leave its starch molecules exposed and easy prey to digestive juices, much like white flour. The reason lies in the way whole grains are fractured during the industrial milling process to separate the starch energy from much of the rest of the kernel’s nutritional essence.In its natural state, a whole grain is composed of the germ, the grain embryo that is rich in protein, fragile omega-3 oils, and vitamin E; bran, the tough outside covering with protective phytic acid; aleurone, the protein layer inside the bran that contains most of the vitamins and minerals, as well as some oils and enzymes; and the endosperm, the starchy food supply for the embryo. In contrast to grains that are stone ground at moderate temperatures, commercial millers grind grains using high-speed rollers, a process that heats flour to between 400 and 500 degrees. In so doing, the starchy endosperm is separated from the heart of the grain’s nutrition located in the bran, aleurone, and germ. The result is flour, stripped of oils, with a long shelf life—flour that cannot go rancid. The USDA does not have strict standards for labeling whole wheat flour. As long as flour contains 51% whole wheat, flour can be labeled as such. Often manufacturers add back bran (which does not go rancid) to give a brown coloration to flour that they label whole wheat. Legitimate whole wheat flour must be stored in a refrigerator or freezer within several days of grinding to prevent rancidity. Be leary of whole wheat flour on grocery store shelves, even flour that is labeled “stone ground.” If you want the natural goodness of 100% whole grain flour, you will not find it in supermarkets. The best sources are by mail order from reputable millers (see September/October 2012 newsletter). 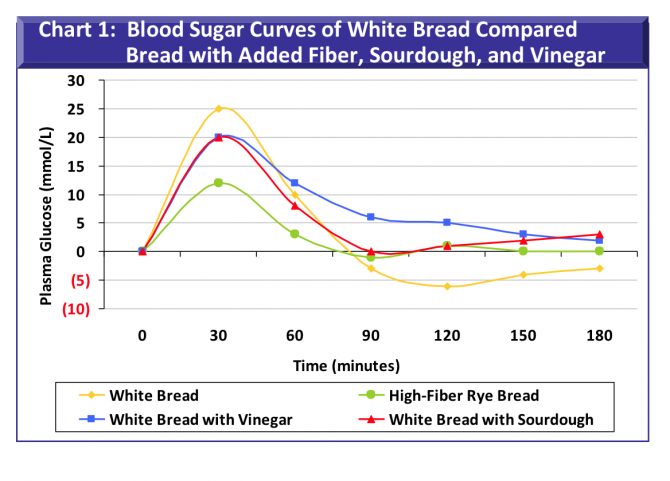 Chart 2 also illustrates the lower blood sugar impact of bread made with legitimate stone ground whole wheat flour (GI, 53). The lower GI is largely attributable to the oils in real whole wheat flour which slow the digestion of the carbohydrate portion of grain. Charts 1 and 2 also indicate that the addition of slow-to-digest whole kernel grains can moderate the blood sugar effect (GI, 40). Adding cooked whole grains to baked goods is an excellent way to add “crunch” and reduce their blood sugar impact. Charts 1 and 2 also suggest that of all breads available, one of the best choices is to bake your own artisanal sourdough bread made from stone ground heirloom flour or know a good friend who does. 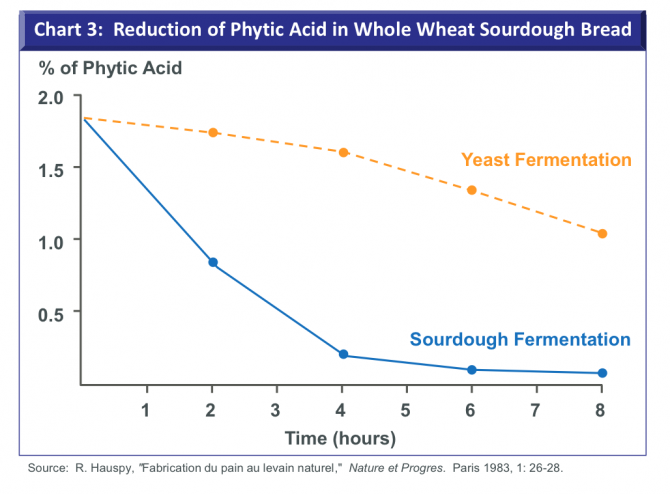 Authentic sourdough prepared over several days to allow lactobacilli to fully convert maltose to lactic and acetic acid can significantly reduce the glycemic index (GI, ~ 30). If you do purchase sourdough bread, be wary of loaves that are doctored with vinegar and other flavorings to emulate the real thing. Sourdough Blood Sugar Testing, a further aside. Before writing this newsletter, I conducted my own blood sugar tests using a modified recipe for buckwheat muffins to which I added varying amounts of sourdough. Recipes were tested as the first morning meal after a 12 hour overnight fast using a glucose monitor. Sourdough as the major component (75%) of the recipe, with very little added buckwheat flour (25%), curbed my blood sugar so that over the two hours of testing, my blood sugar hovered around the zero line (see Chart 1 for a reference). Universally with every test, my blood sugar peaked not at 30 minutes, which is standard, but at 90. This suggests the satiety and staying power that sourdough can lend when you add it to your favorite recipes. Phytic acid. In addition to containing the blood sugar spike normally associated with carbohydrates, sourdough degrades phytic acid. Recall that phytic acid is found in the bran of whole grains and that it blocks the absorption of minerals such as calcium, magnesium, iron, copper, and zinc as well as the digestive enzymes pepsin and amylase. Reducing phytic acid by soaking flour ingredients with sourdough makes the vitamins and minerals in the aleurone layer (inside of the bran) and the germ of whole grains more bioavailable (see Chart 3 below). Lysine. Sourdough also boosts lysine, the limiting amino acid in grains that prevents them from being a complete protein. Sourdough fermentation can increase lysine levels in wheat by three fold or more,2 augmenting this missing amino acid. For people who really like rye and want even more lysine, you can also add rye flour when making bread because, of all whole grains, rye is the highest in lysine. Because, unlike wheat, the composition of rye proteins does not support a strong gluten network, using more 25% rye flour results in a weak loaf better suited to pan baking. Sourdough’s potential role in wheat allergies and gluten intolerance. Whether sourdough can be used to resolve wheat intolerances is one of the biggest questions relating to sourdough’s potential. Unexplained is the recent rise of celiac disease and vague wheat allergies. Celiac now affects one in every 50 people, a number in stark contrast to the 1 in 1200 of just 30 years ago.3 One must wonder if our new hybrid dwarf wheat described in the last newsletter and the shift away from sourdough to baker’s yeast underlies much of problem posed by wheat today. Sourdough does appear to hold promise for people who cannot tolerate wheat: Evidence suggests that lactobacilli in sourdough break down wheat gluten to make wheat proteins easier to assimilate by people with wheat allergies and celiac disease. Rafaella di Cagno and her team of researchers produced, with selected strains of sourdough, bread that seemed to be well tolerated by celiac sufferers.4 It appears that using sourdough fermentation with heirloom varieties of wheat can make wheat acceptable to many with wheat sensitivities. But, for people who suffer from true celiac, no gluten grains are currently safe to eat, even if they have been fermented with sourdough. We must await more research, but the future role of sourdough for gluten sufferers does hold promise. Some years ago, my good friend Ellen Arian taught me how to keep sourdough and make 3-day artisanal sourdough bread, something that has become an enduring and endearing habit. Feeding starter, working with dough on the second day, and baking on the third is rewarding and gratifying. I like to “spread bread” by sharing it with friends in my community. But making sourdough bread requires an investment in time, patience, and equipment. It can be a challenge at first because so many variables contribute the outcome—the starter, flour, geographic conditions, and temperature and humidity that vary with the seasons. In the future, I plan to write a separate piece about making sourdough bread and will post it on the Recipe tab, Slow Food section of my website. For now, I want to help you get started on the basics of keeping starter and using it in your favorite recipes—muffins and biscuits, pancakes and waffles, and other quick breads. Sourdough will enhance the flavor and texture of them all. And, if you take the time to pre-soak the flour ingredients, you will curb the blood sugar impact and reduce phytic acid to make minerals and enzymes in the flour more bioavailable. Obtaining a Sourdough Culture. One of the easiest and best sources of sourdough culture is from a friend who bakes often and lives nearby. You can also grow your own, but doing this in the winter months is tricky and it can be a challenge to get a starter to evolve into a stable culture with staying power. If you are interested, see http://www.breadtopia.com/make-your-own-sourdough-starter/. Maintaining a Culture. A culture is a pre-ferment. Growing a culture the day before baking gives any baked product a jump on flavor and nutrition and makes kneading easier. Once you have the materials, the first question to ask yourself is what do you plan to bake and how much starter will you need for the job? I usually use starter to make two loaves of sourdough bread, each requiring one cup of starter. So, I use a 2-quart jar and begin with ½ cup starter I then feed the ½ cup starter in three feedings of flour with equal parts water, in progressive fashion. After each feeding of flour and water, stir well, cover loosely with the lid, and allow to double on the counter top. 1st feeding: ¼ cup flour (First Clear) and ¼ cup water. 2nd feeding: ½ cup flour and ½ cup water. 1st feeding: 1/8 cup flour and water. 2nd feeding: ¼ cup flour and water. 3rd feeding: ½ cup flour and water. Place in refrigerator until the next day, when you use it for baking. Note: I always pour off any remaining starter and keep it in reserve in the refrigerator as a “safety” should anything happen to my working batch. Note the pattern for feeding: Whatever amount of starter at the outset, a general rule is to feed it in three progressive intervals… first, half; then, equal, and finally, double the amount of flour and water relative to the amount of initial starter. You do not want to overwhelm the culture at the outset with too much flour since excess food without enough yeast and bacteria to consume it can attract foreign invaders and spoil a culture. A small feeding at first gives the yeast and bacteria time to divide and populate the culture so it can handle progressively larger amounts of flour. If you forget to feed a culture once it has doubled in size, it will fall back, losing volume. This is a sign that it has run out of food, is hungry, and needs to be fed again. Yeast work more rapidly than bacteria so a culture will reach its full volume before the bacteria have completed their work converting maltose to flavor compounds. Once starter has doubled 3 times to reach its maximum volume, put it in the refrigerator. Bacteria will continue to create flavor, albeit more slowly. Using starter often: Once you have starter, you want to keep it fed and working for you. A starter that is fed often is “happy” and active. After a week in the refrigerator, the microflora run low on food, and some have died. I like to keep my starter active by feeding and using it at least once a week. Starter can be kept for up to three weeks in the refrigerator, but it may require several feedings to bring it back fully to life. Alternatively, if you plan to use a great amount of sourdough, calculate the amount of flour and water in the starter (e.g., a cup of starter contains ½ cup flour and ½ cup water) and reduce the flour and liquid ingredients in the recipe by the same amount. “To adapt a yeast recipe, begin with a small amount of starter, about ¼ cup for recipes using less than 6 cups of flour and about ½ cup for recipes calling for more flour. Mix the starter with some of the flour and some of the liquid from the basic recipe you want to convert. Figure that 1/2 cup starter has replaced ¼ cup flour and ¼ cup water. In baking powder recipes figure the same way, but use up to a cup of starter even in recipes calling for only 2 or 3 cups of flour. Experimenting with sourdough is a fascinating adventure with endless possibility. I have fun pushing sourdough to its upper limits when adapting recipes in order to capture its many health benefits and because I like the moist texture, body, and staying power that it gives to baked goods. I also like the way it satisfies and I enjoy its sour flavor, probably more than would be true of the average individual. The first recipe for cornbread is my own, but the remaining ones are from Sara Pitzer’s Baking with Sourdough. This is a concise book on sourdough that has a variety of baked goods recipes using different amounts of sourdough. This array of recipes can give you a sense of how much sourdough you might want to add to a favorite recipe of your own. Sourdough is an especially welcome addition to cornbread to keep it moist and improve texture. It is also enhances recipes that include maple, banana, and chocolate. Combine dry ingredients. Mix wet ingredients. Combine wet and dry ingredients. Bake in a 375 degree oven for 20-30 minutes. If you choose to presoak the cornmeal and flour with the sourdough, mix these and let stand overnight. Then add the baking powder, salt, and wet ingredients just before baking. For the lunchbox: sandwiches made of banana bread spread with a filling of cream cheese and chopped dates. Put the 2 cups of starter into a large bowl, cover loosely and allow to sit for at least 10 hours in a warm place. When ready to bake, mix hone, salt and oil into the starter. Sift in the baking powder and whole wheat flour. For finest texture, discard any bran which remains in the sifter,, but for a heartier biscuit dump the bran right into the mixing bowl with the other ingredients. Mix everything well, but do not over beat. Combine the first 4 ingredients in a large bowl, cover loosely and allow to stand in a warm place overnight, or for at least 8 hours. Beat together the eggs, sugar, salt, and soda, and stir into the starter combination with a wooden spoon. At this point, don’t beat. Bake the pancakes on a lightly greased griddle, turning when bubbles appear. These pancakes are quite fat and fluffy and very tender because of the reaction of the soda with the sourdough. If you want them to be thinner, stir in a little more water as you are adding the egg mixture. Variations: Add a quarter cup of toasted wheat germ to the egg mixture to give a nutty taste and increase the food value of the recipe. For even heartier pancakes, add ¼-1/2 cup chopped pecans before baking. Mix together first 4 ingredients in a large bowl. Beat well. Cover loosely and allow to stand overnight or for at least 8 hours in a warm place. When ready to bake the pancakes, stir in the beaten eggs, sugar, salt, baking powder and melted butter. Finally, stir in the baking soda dissolved in water. Do not stir again after adding the soda. Bake on a moderately hot griddle, taking care not to let the buckwheats burn. For darker pancakes with a truly old-time taste, allow the batter to age longer than 8 hours and substitute molasses for the 2 tablespoons of sugar. Roll the chopped dates in the 2 T. flour or mix them with the flour in a bowl so that they do not stick together. Gently stir them into the batter. Pour the batter into a well-greased 9-inch pan and bake int a preheated 375 F degree oven for about 30 minutes or until the batter tests done when poked with a toothpick. Concluding comment. I hope that these recipes give you an idea of how to use sourdough—first, in terms of the proportions of sourdough to use depending on what type of baked good you are making; second, the time that sourdough needs to rest at room temperature to be activated before being added to ingredients; and third, the time that sourdough and ingredients need to rest on the counter top before baking. Finally, remember that most sourdough baked goods taste much better cold than they do when they have been taken right from the oven. Sourdough bakery goods last a long time and are excellent baked ahead on weekends for lunch boxes and snacks. They easily keep and develop flavor through the week.